Interested in a multi-activity break? One phone call to us and everything will be arranged for you. Whether solo, with partners, with friends, with family, on a stag or hen party, contact us and we will arrange a programme to suit your tastes and abilities. Prices on application. Group party discounts. Fun for all ages. Can't cook? Well after this course you will surprise your freinds and family. 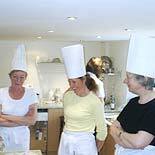 We are carrying out courses in a very relaxed atmosphere to put the fun back into cooking. Let us sort out your problems for dinner parties, planing menus, helping you with theme parties and giving you confidence on how to prepare inspirational starters by Award Winning Head Chef Stuart Reed. Plucking and preparing Wild game. Welsh Brecon venison, filleting and preparing fresh river/sea fish also fresh shell fish. Welsh black beef, fresh hill side lamb, salt marsh lamb, and pork from the new welsh breed with exciting fresh sauces also inspirational vegetarian dishes carried out by MBE Award Winning Chef Peter James. Puddings carried out by Paulette Reed Pastry chef, also courses with a Welsh flair. Think Wales has only got leeks? Well you'll be mistaken because you are going to see a fresh Welsh larder which will compete with any country. In the evening you will be sampling some of the freshest dishes Wales has to offer in our award winning restaurant. Reflect on the fun day you have had over a cool glass of Welsh wine whilst getting comfortable for the evening talk about rural life. All walks start from Llanwrtyd Wells and whatever the distance - 10 miles and 25 miles being the most popular - are designed to include everything from minor roads to mountains depending on capabilities. Walkers are advised to carry the local Ordnance Survey Map and a compass at all times. Spot the Red Kites whilst drinking in the views. Blisters? What blisters? Get away from it all because mobile's don't work in mountains! 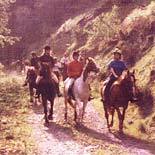 The first trekking centre was established in Llanwrtyd Wells in the mid-1950s and continues to this day. Safe riding for all abilities through pine forests without sight or sound of traffic is relaxing and therapeutic. Spectacular scenery, a sure-footed friend, and fresh air - a great way to see the countryside. Fish in the River Irfon at Llanwrtyd Wells for salmon (who knows, you may catch trout, grayling and chub as well). Sit in solitude and enjoy the peace, listen to the sound of running water and watch the dappled light filtered through the trees onto the river surface... just before you land a 14 pounder! From a local pitch and putt course to 18-hole professional fairways, there are options for all. Llanwrtyd Wells is surrounded by golf courses - at Builth Wells, Llandovery and Brecon. Clubhouses are fully equipped. Tee off with confidence and swing your club for a 'birdie'.